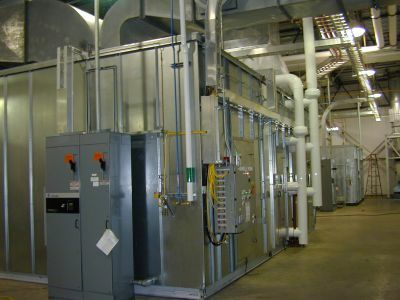 For General Motors’ Grand River Paint Ship in Lansing, MI, AbsolutAire delivered twelve custom-designed S-Series air-handling systems. Built to GMs exacting specifications to ensure world-class finishes on its cars and trucks, the multiple units are outfitted with advanced microprocessor controls so that all operating parameters can be globally monitored and precisely adjusted as needed. GM painting operations pay strict attention to atmospheric controls, and maintain temperatures within +/-2 degrees F and +/-5% relative humidity. The AbsolutAire S-Series units for this facility were designed to deliver 100% outside air with seasonal changes in the way they operate. During winter months, the air is heated, humidified, and then re-heated. During summer months, the air is cooled and then re-heated. System performance has been exceptional in meeting GMs stringent specifications for its paint-finishing operations.